Returning from a successful lunar landing mission, NASA's Apollo 18 suffered a computer error that forced command module pilot, Bo Cunningham, to take the controls and fly the spacecraft to an emergency landing in the remote Takla Makan Desert of western China, far from the intended splash-down target in the Pacific Ocean. Thirty-six hours would pass before NASA located the spacecraft, by then the site of a national tragedy. 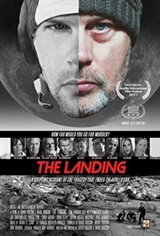 What happened during the astronauts' time in the desert, the inquiry that followed and the mystery surrounding the event, is the subject of this documentary.